“Wednesday?” scoffed Dreadzone’s charismatic frontman MC Spee. “It’s Saturday already!” and the crowd at the Scala in King’s Cross were inclined to agree. For a midweek date there was an palpable swell of enthusiasm, both from the veteran dub band - who are drawing towards the end of a wide-ranging European tour - and the impressively sparky audience, most of whom, it has to be said, were edging towards the wrong side of forty. It was clear that many of the attendees were enjoying reliving the glory days of the mid nineties - none more so than the six musicians on stage, for whom the party never ended. 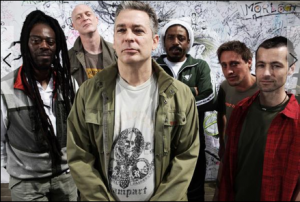 Dreadzone are a band who - save for a brief period in 2006 when guitarist Steve Roberts sadly passed away - have always been touring, and it shows. From the word go this is an thoroughly tight ship of a live show, the band holding an impressive command of their loyal flock. At the heart of it all is MC Spee, whose leg injury did not hinder or dampen his stage presence. The frontman spent nearly the entire gig sat down, but still managed to be the most lively temporarily disabled singer-rapper seen on a London stage in years. He ingeniously incorporated the crutch he has to walk with into his ever-memorable dance moves, brandishing it aloft like the tribalistic opening scenes of The Lion King. Musically, Dreadzone haven't really changed since they started fifteen years ago, and they flit comfortably between dub reggae (genre standards 'Chase the Devil' and 'Get Up, Stand Up' are crowd-pleasingly worked in) and nineties breakbeats. They are best within this mould - attempts at ballads and rock anthems fall a little flatter, though the crowd don't seem to mind. Indeed, they hang on every word. A curious blend of ageing ravers and crusty old hippies, they suffered not from the inhibitions or insecurities of the young and flung themselves admirably into their dancing rituals. There are few sights more entertaining than a skanking 60-year-old. Even my companion, who admitted he had never previously heard of the band, found himself suckered into the hypnotic cacophony. Dreadzone are doing what they do best, and even if their brand of dub-based dance isn't to your tastes, it's hard to deny they're doing a bloody good job of it.